Guitarist Tony Iommi and bassist Geezer Butler admitted that they didn't realise that he was back to drinking alcohol and taking drugs as they recorded the band's latest album 13. Tony told Classic Rock Magazine: "You know what, I couldn't believe it. He was working at my house and I didn't pick up on it at all. None of us did. He really hid that well. "It was a shock, actually, when [Ozzy's wife] Sharon told me. I just couldn't believe he'd been drinking again. I didn't see any signs of it." Geezer added: "He was really good at keeping it secret. I thought he was talking a lot - he used to drive us nuts because he wouldn't stop talking - but we put that down to the excitement of doing the album." 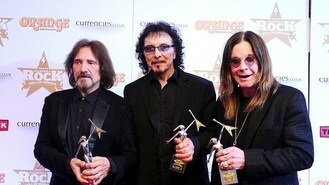 Ozzy revealed that he relapsed and had fallen off the wagon in a statement on his Facebook page in April. He wrote: "For the last year and a half I have been drinking and taking drugs. I was in a very dark place and was an a**hole to the people I love most, my family. However, I am happy to say that I am now 44 days sober." The pair said they didn't notice any signs because Ozzy didn't seem troubled during the album's recording process. Geezer said: "It certainly didn't affect his performance in the studio... To us, he'd worked better than ever. Sharon told me and Tony, and by that time Ozzy had gone into rehab."